North Augusta's newest neighborhood. Absolutely beautiful and less than 2 Miles to I-20 exit #1. Only minutes to Augusta. The popular Halifax Plan. Energy Star efficient home featuring Luxury Vinyl Tile plank with hardwood look in all living areas.Granite kitchen counters in kitchen and tile backsplash. Stainless steel Whirlpool appliances and 8" stainless double sink. Oil rubbed bronze fixtures. Owner bath with garden tub, walk in shower, framed mirror. Breakfast Room and separate Dinning Room. Three additional bedrooms and one full bath on opposite end of home. 10x12 patio. Fully landscaped with Rainbird sprinkler front, back, and sides. Beautiful Home in perfect location. Double car attached garage. 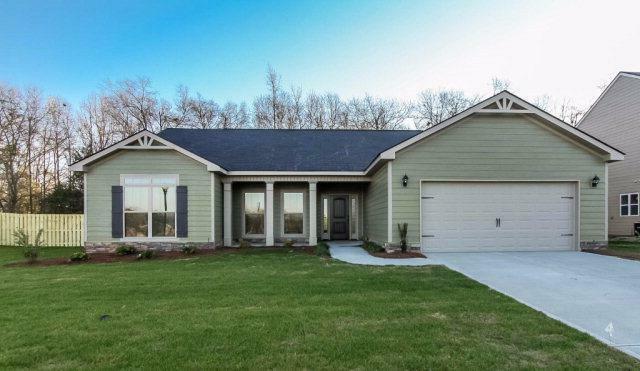 Picture is of plan, but not of this home. Listing provided courtesy of Fox Chase Team of Meybohm, Llc North Augusta.